The ukulele has long been a favorite instrument of guitar players and singers alike, whether it's traditional Hawaiian musicians or rockers like Tom Petty, Eddie Vedder and George Harrison. 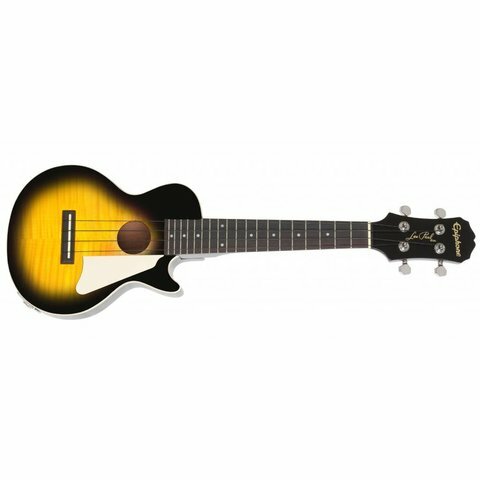 Long known for its history of making great Les Paul guitars, Epiphone expands upon that knowledge and experience with the NEW Les Paul Acoustic/Electric Ukulele Outfit. Like a traditional Les Paul Standard, the Les Paul Ukulele features a solid Mahogany body combined with a AAA grade flame Maple top for great tone and great looks. The Okoume neck features a comfortable “D”-profile shape and is bolted onto the body with four-recessed screws for rock-solid stability. The fingerboard features a concert length 15" scale with 19 silver nickel frets and a 16" fingerboard radius.